By Bangladesh Media; Three 'suspected pirates' were killed in a ‘gunfight’ with Rapid Action Battalion (RAB) on Tambulbunia Khal in Sarankhola Range in Bagerhat district Tuesday. Deputy commander of the battalion RAB-8, Major Anwarul Kabir confirmed the report. He demands that RAB also seized 16 firearms after the fighting. Among the victims two were identified as Qader and Kalyan. 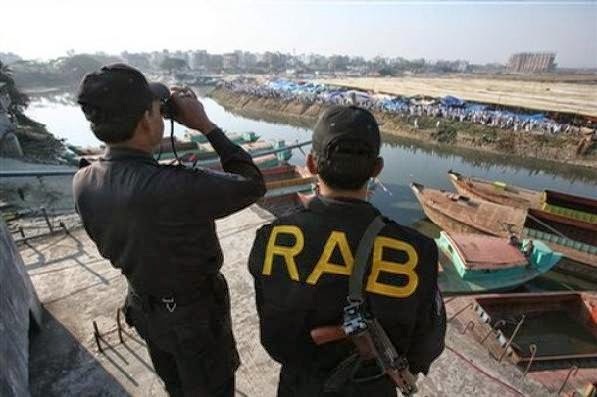 The fighting broke out when the 'gang of forest robbers', locally known as 'Shirsho Bahini', opened fire during a RAB raid at about 7:00am on Tuesday in the canal, ATM Habibur Rahman, director of legal and media wing of RAB said. The canal is located under Sarankhola range in the Sundarban's east division. RAB personnel and the pirates traded fires for about half an hour, leaving those three dead on the spot.